Meadows Place was part of Stafford’s extraterritorial jurisdiction prior to incorporation on November 14, 1983. 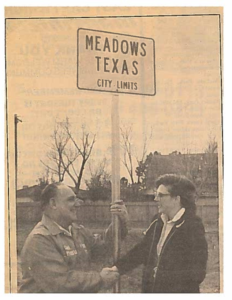 In this photo from 1984, County Commissioner Alton Pressley, a Meadows, Texas resident, shakes hand with Meadows first Mayor, Sue Troyan, as they celebrate the first Meadows, Texas road sign. 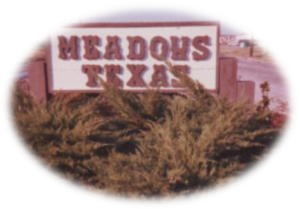 Meadows Place was incorporated as Meadows, but this was changed to “Meadows Place” in 1997 due to postal conflicts with a city of a similar name, Meadow, Texas. The “One Square Mile” city of Meadows Place has its own police force and 24/7 fire and EMS protection. It is one of just two cities in Fort Bend County and 90 nationwide that have a Class 1 ISO Fire rating and the only city in the Greater Houston area to have all “Smart” water meters that send the data directly to the utility office in City Hall. In 2011 Meadows Place built an award winning lake that utilizes reclaimed water and serves as a recreational center and storage for city irrigation water.. In 2015 Meadows Place YAC (Youth Action Council) was created. In 2016 Meadows Place installed Free Little Libraries and added significantly to their hiking trail system. In 2019, the S. Kirkwood reconstruction project was begun. 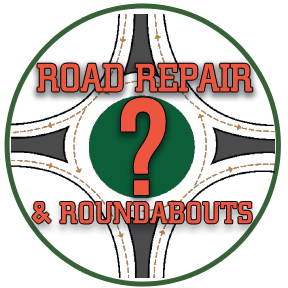 It will replace the four stop signs with four modern roundabouts and add linear parks. The current mayor is Charles Jessup.